The owner has enjoyed this one for the past four years and is going to let the owner enjoy it just as much! Indoor heated winter storage and always kept covered, the owner has really gone overboard in keeping this one looking good and ready to go! Our offers are contingent upon an inspection so get yours in today and out on the water soon! 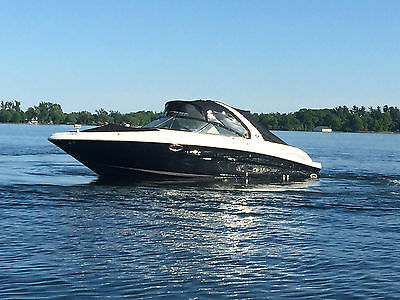 Stock #137641 This 1993 classic Sea Ray 400 Express is looking good and ready to go today! If you are in the market for an express cruiser, look no further than this 1993 Sea Ray 400 Express, priced right at $83,400 (offers encouraged). 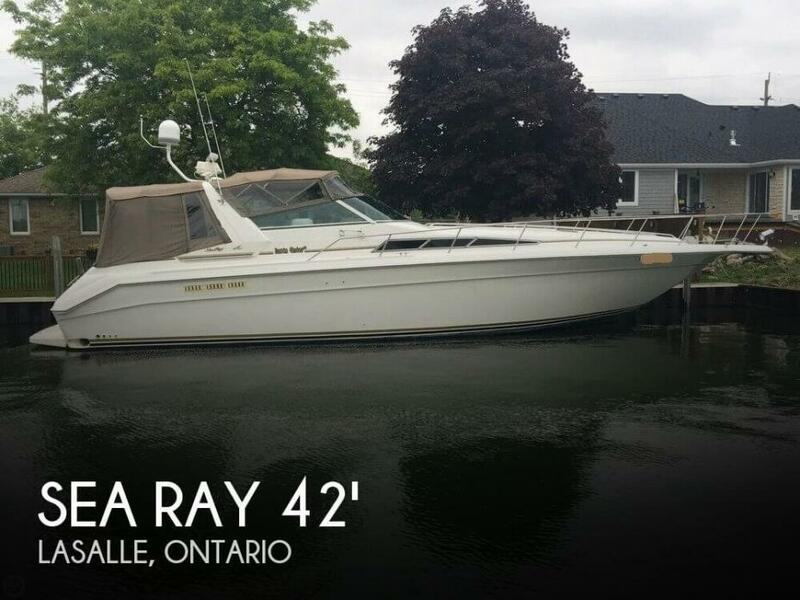 This vessel is located in Port Franks, Ontario and is in great condition. She is also equipped with twin Caterpillar engines that have 1,350 hours. Reason for selling is upgrading. Talk about a luxury boat. Large open bowrider with several amenities. Wet bar includes bottle rack holder, fridge, sink cooler and storage. Great sounding stereo system, lockable head, large ski locker and abundant amount of storage. Well powered with silent choice.Length: 29’6” OAL Width: 9’8” Weight: 7,700lbs Engine: Twin 350 MAG MPI Bravo III Hours: 110Canvas: Bow/Cockpit cover, Camper enclosure. Electronics: Smart craft, Clarion DZC625 Fuel Capacity: 130 G / 492 L Trailer: Not included Additional features: Silent choice, wet bar, lockable head, shore power. Buyer is responsible for transport. Can help to have loaded. 1985 Sea Ray in outstanding condition, twin 454's, generator, new carpets, new sofa, lots of pics have a look contact me if more required. Just Launched. Survey completed in 2012 happy to email on request its full of details, and 2 issues have been updated fixed and now comply. Heat and AC Twin Helm Stations Great Canvas, rear bimini new summer 2014 New Batteries May 2015 Everything works - water heater, fridges, head, lights etc Needs electronics - good GPS or use ipad 454's start right up and run out nice approx 1400 hours Needs a buff and wax and the teak wood trim sanded and stained Low Reserve, also for sale locally, more than happy to show and sea trial for serious buyers Located in St. Catharines, Ontario, will deliver to Wilson, NY for $500. to the dock, taxes extra. with full prepayment prior to departure. Send me your email address and I will send survey it has got most of the answers to any questions you may have. Bought a new house on the water, looking for a large twin engine bowrider or cuddy. 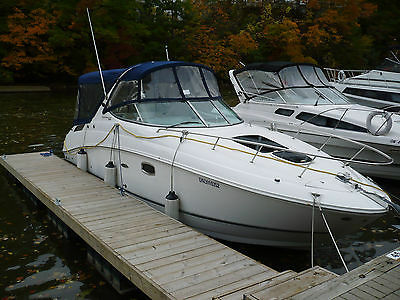 Will put in extra cash into the deal with trade, would really like a Sea Ray SunSport 280 or 290. Or a fun manual car, truck, suv - Bronco, Blazer, SSR, 90-02 911, 60's 70's 2 doors, you get the idea. Thanks for looking happy bidding. 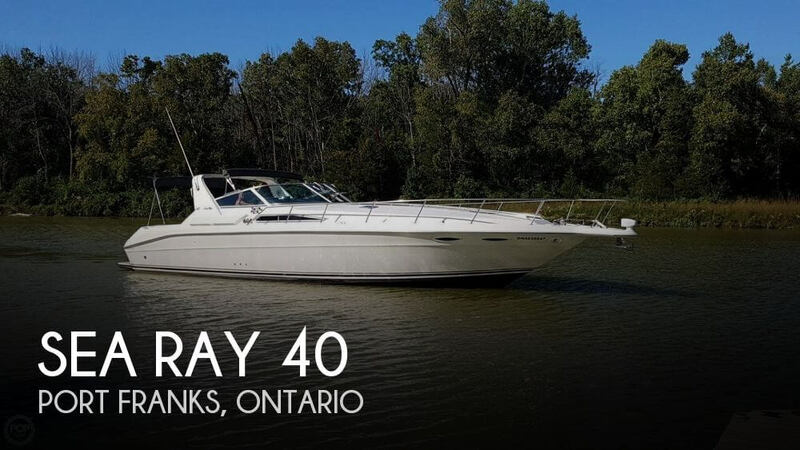 Beautiful SeaRay Cruiser with a bright, roomy, airy cabin. One owner boat with low hours ( approx. 55 hours). Loaded with options including air/heat, windlass with chain, macerator, cockpit grill, teak cockpit table with filler cushions forming a sun pad / sleeper area, extended rear platform. Boat has not been smoked in and no cooking has taken place on board. 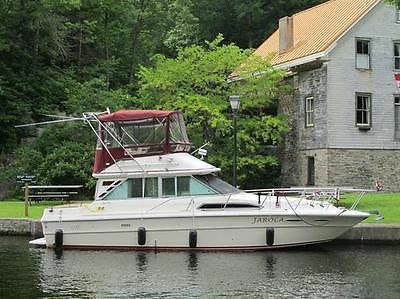 Boat is located near Toronto, Ontario. Professionally serviced and stored indoors in the winter. Owner can help with shipping and/or storage arrangements if needed.